Continued from Crop to Cup Part 1. At the completion of Crop to Cup Part 1, we left the beans fermenting in water at stage 2 above. I was a little unsure of how long this may take (72 hours or up to a week), though armed with the knowledge this phase would be complete when the mucilage (slippery outer layer) was easily rubbed away. 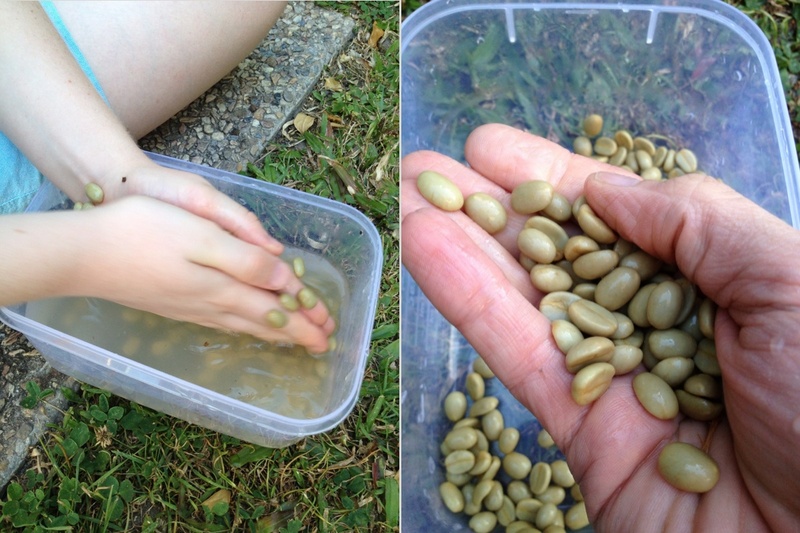 Daily testing was undertaken, until on day 7 (exactly as predicted by my mother), rubbing one of the beans between thumb and finger resulted in a slightly gritty/pebbly feel rather than a slippery one. Time then to move onto drying. 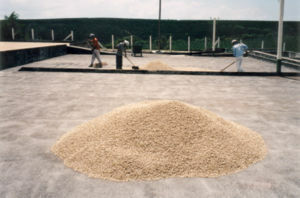 Once the beans have fermented for long enough, they are required to undergo a final wash and rinse, before being laid out on drying beds. In aid of passing down the coffee loving tradition to the next generation, my son was enlisted to rub off the mucilage, with repeated washes then performed to remove any remaining on the outside of the bean. Agitating the beans and replacing the water over three washes was sufficient to achieve this. The beans should be spread out in a thin layer no more than 3 cm thick, stirred three times a day, and be protected from rainy weather. Drying in this way can take 5–30 days, depending on the seasonal weather pattern. 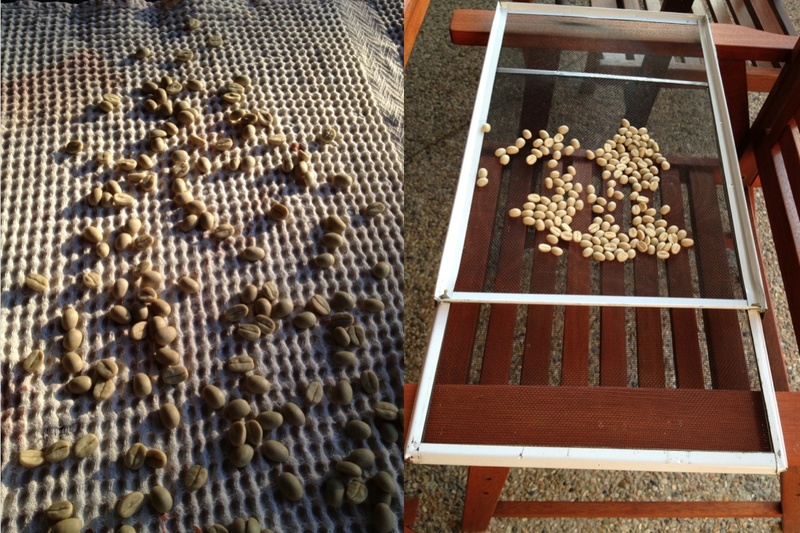 As you can see below, an initial drying of the beans was done on a small towel, before transfer to a drying rack to allow plenty of airflow around the beans. The rack is situated under cover to avoid any weather or dew, however sees the mid to late afternoon sun, which should assist with drying. Given the small crop I am processing, a single layer of beans was placed on the drying bed, with little chance of any mould formation (the reason for stirring daily), though I aim to ensure the beans is are turned regularly. I hope you will join me in a couple of weeks for the next post in this series, where we will be up to removing the remaining parchment layer and roasting our crop!